INCREASES FLAME TIMES BY 35% ON ALL SIZES AND BRANDS OF LOGS OR BY ALMOST ONE XTRA HOUR ON THE POPULAR 5LB SIZE. By placing your firelog against the back of the tray, it will burn under better control, more efficiently saving you fuel and money. Ffrelogs will burn longer, more evenly and completely. Vertical ribs of the back of the tray are especially designed to ensure that any size log burns entirely. As a firelog burns, it becomes less rigid. At one point, it is common for logs to fall through the standard firewood grate and cause dangerous flare-ups. The XTRAFLAME FIRELOG BURNER TRAY prevents log breakdowns and flare-ups. All ashes remain on the tray for their easy removal and since they are not emitted into the air there is less pollution. The back of the tray acts as a heat reflector throwing maximum heat into the room. It also prevents flames from causing damages to the walls of your fireplace. The XTRAFLAME BURNER TRAY WITH HEAT REFLECTOR is treated and covered with a high heat paint to provide close to a lifetime of enjoyment. Fits all open fireplaces. 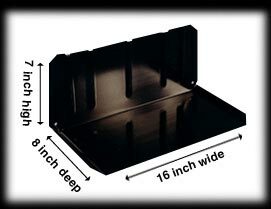 Adaptable to all fireplace grates with a minimum depth of 8 inches. Resting the tray on two standard construction bricks works also very well. Laboratory tested and certified by recognized organisations such as Warnock Hersey Professional Services Ltd and Conmet Canada. Already thousand of satisfied customers!